Are You Ready to Buy Gilead? Gilead's recent weakness will soon present a very low-risk entry opportunity. Shares of Gilead ( GILD - Get Report) have drifted back down to a major support zone. For patient Gilead investors, this recent weakness will soon present a very low-risk entry opportunity. The stock's 6.5% drop from its June high came to within pennies of $82 this morning. 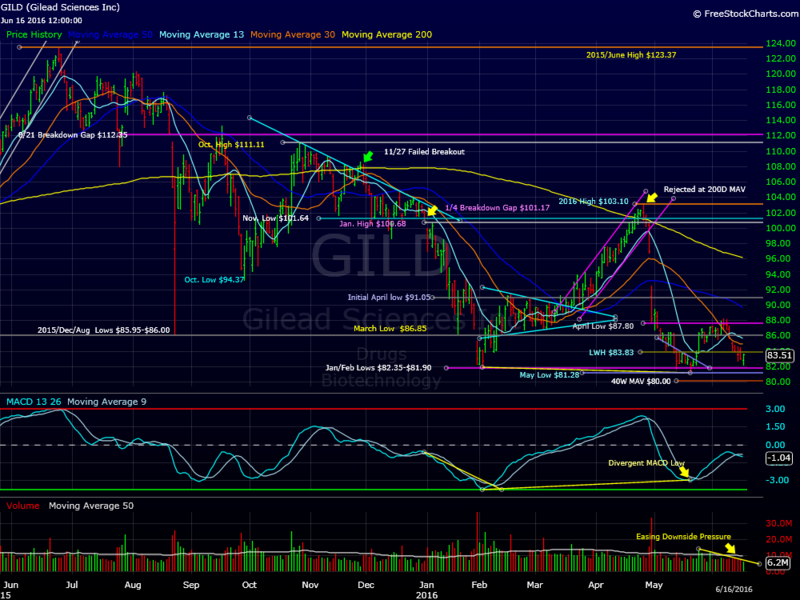 If Gilead continues to base in near this level, a significant bottom could be the result. Back on April 28, Gilead began a massive breakdown. Just three days prior, the stock's powerful rally off the January/February lows stalled near a very heavy 200 day moving average. After dropping 3.7% on April 28 the stock fell another 9% the next day on its second heaviest volume in over a year. This earnings-inspired collapse completely wiped out the entire April rally while leaving behind an ominous top near the 200-day moving average. The stock would continue lower into mid-May before finally becoming exhausted as the $82 area came back into play. Gilead managed a slight bounce after retesting the January/February lows. This rebound extended into early June before being turned away at the April low. Gilead began to fade again a week ago, and by mid-Thursday, the stock had returned to the old lows. In the near term, Gilead bulls should consider the stock a low-risk buy between $83 and $80. This major support zone includes the January low near the upper band and the 40-week moving average at the lower band. Gilead has not tested its 40-week moving average since mid-2012. If the stock can extend its post first-quarter earnings base building process near this zone, a powerful rebound rally could quickly develop.